Thanks to British celebrity bakers like Paul Hollywood, making sourdough bread has become very popular. Despite a reputation for being difficult to make, sourdough is actually easy; what it does require though is a sourdough starter, time, and a degree of patience. The effort though is certainly worth it for the slightly, chewy bread with its distinctive 'sour' taste. Sourdough is one of the original methods of bread making going back centuries, well before commercial bakers yeasts was available. 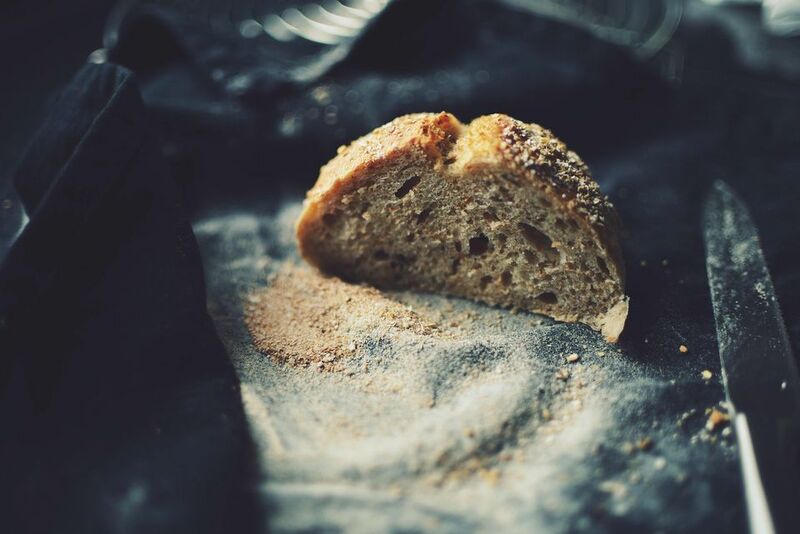 We are more accustomed to adding cultured yeasts when making bread, but the wild yeasts in sourdough are believed to be healthier for us as well as easier to digest. The natural ferment used for the sourdough bread (the starter) also creates an acidic environment in the loaf which bacteria do not like. So, sourdough lasts much longer than commercial bread, and even when a week old still makes great toast. Before you begin make sure you have your starter ready and vigorous. This may require feeding for a few days if it has been dormant. The sourdough will keep for up to a week. Do not place it in any plastic as this will soften the crust. Instead, place in a paper bag or into a bread bin. The bread keeps really well and even after a week is still great toasted. A banneton is a purpose made bowl for proving bread. It is usually round and determines the finished shape of your loaf. The banneton will often have circles or indent, which create a decorative effect on the loaf. Mix the salt and flour together in a large, roomy baking bowl. Make a well in the center and add the starter. Drawing the flour into the center, mix the flour together with the starter to create a loose dough. You can use your hands to do this. If the mixture is too dry add warm water, a little at a time until you produce a soft, slightly sticky dough. Sprinkle your worktop lightly with a little flour. Tip the dough onto the worktop and knead the dough until it is smooth, silky and elastic. Note: if the dough is very sticky, sprinkle with more flour. Too dry, sprinkle with a few drops of olive oil and continue to knead. You can expect to be kneading for about 12 to 15 minutes. Once the dough is smooth, silky and elastic, lightly oil a roomy mixing bowl with the olive oil. Tip the dough into the bowl and cover the bowl with cling film/saran wrap. Place the bowl in a cool, not cold, draught-free place and leave for up to 6 hours or until the dough has doubled in size. If you want, leave it overnight but in a colder space; this will allow the bread to rise very slowly. Once doubled, tip the dough onto a floured surface. Knock out the air from the bread and knead the dough lightly for a few minutes only. Roll the dough into a ball, dust with flour and place into a floured banneton or mixing bowl. Cover the bowl or banneton with a tea cloth. Again place in a cool, not cold place and leave to rise slowly for 8 hours. Heat the oven to 475 F. Place a roasting tin filled with ice cubes on the lowest shelf of the oven. The vapor is given off from the ice cubes as they melt help to "steam" the loaf as it cooks and creates a lovely crust to your loaf. Line a baking sheet with greaseproof paper and grease very lightly with a little olive oil. Lay the risen loaf onto the sheet (do not worry if you lose a little air from the loaf as you do this, it will come back in the oven). Place in the middle of the preheated oven and cook for 30 minutes, then lower the temperature to 400 F and cook for a further 20 minutes or until the loaf is golden brown, the outside crust crisp and the bread sounds hollow when tapped on the base. Place the loaf on a cooling rack, and leave to cool completely before eating. Sourdough can be used as any other bread and, of course, is delicious freshly made and spread with butter. Yum.